Previously on The Flash: Barry Allen, Fastest Idiot Alive, The Scarlet Simpleton, The Sultan of Bad Life Choices, ruined everything because his dad got killed by one of the roughly seven-kajillion speedsters in this universe. Multiverse. Whatever. Barry’s dad got killed by Zoom, so Barry went back in time and saved his mom. Like... okay... I guess parents are pretty interchangeable, Barry. That makes total sense. You goober. Some other stuff happened, too, but does it really matter? Barry whipped that pre-existing timeline like it was a batch of heavy cream and he desperately needed to decorate a cake. Nothing that came before Barry’s monumentally terrible and selfish decision to demolish life as everyone knew it applies anymore... except it does. Because of course there has to be a little bleed over from the old timeline somewhere in the new one. Side note: there will be spoilers to the Flashpoint comic series in this review. If you're planning on reading the comics and don't want the ending ruined, don't read. Or, better yet, just go get Flashpoint now and read it. It's a pretty quick story, all things considered. I'll wait. WHO LET THIS DOOF HAVE ACCESS TO THE SPEED FORCE? Everything in Barry’s new life is perfect. He’s got both his parents. He’s got a possible future with Iris. He’s got some other speedster saving his city, which lets him focus on more important things, like gloating at super villains. Hey, Barry? I don’t want to sound like your Classic Literature professor, here, but the Greeks had this thing called “hubris” they liked writing about and I recommend you check a couple of those stories out of the old Central City Library, buddy. Because gloating at your nemesis? Never ends well. Ever. But beyond that, Barry is enjoying three months with Mom and Dad, a (kinda cute, I have to admit) burgeoning romance with Iris, and a fairly normal life as a CSI. Sure, Joe West is a drunk, washed-up detective with strained family relationships, but Barry can work with that. And no, he doesn’t have Cisco Ramon or Caitlin Snow as friends, but it seems like Barry doesn’t really miss them when they’re not necessary for crime fighting. Which is kinda douchey. Does anyone else get the impression that the writers want us to dislike Barry? It’s really weird. Honestly, I’m not entirely sure what the writers are doing with this storyline. Not only is Barry acting incredibly unlikable and making clearly terrible decisions, but the plot itself is baffling. Since it’s right there in the title of the episode, I know the writers are trying to pull the Flashpoint comic story into the show. Which is cool and understandable: Flashpoint was a neat miniseries with good pacing and some great emotional beats and an engaging mystery. Unfortunately, the big mystery (Who caused the timeline disruption?) of Flashpoint is completely taken away for the CW version of the story. They come right out and show us that it’s Barry who causes this huge problem, which just seems like a storytelling faux pas to me. The writers also just sort of rush through this Barry-created Flashpoint universe and it’s a total waste of time because, spoiler: it’s gone by the end of the episode, and a new universe has taken its place. Why waste any effort establishing the Flashpoint versions of the characters? Why take us out of that story, just to shove us into a completely new one in the last five minutes of the episode? What’s the point of “Flashpoint”? Is it meant to establish how much Barry has messed up? Because, if so: good job! Now we all dislike the hero of the story because he’s a bumbling fool who can’t see the obvious consequences of his actions and doesn’t care that he’s messed up the lives of the people he claims to care about. Slow clap for you, writers of The Flash. Sigh. Back into summary mode: in Barry’s new reality he gets pulled into helping Wally (Kid Flash) fight yet another evil speedster who’s mad because he wants to be The Fastest.™ I guess it says something good about Barry that he’s instinctively drawn toward helping people, even when he technically doesn’t need to, but I’m not sure how much credit to give him for that. His previous actions still make him a really selfish moron, and the proof that he’s perfectly conscious of what actions are good and what actions are bad makes things so much worse. Barryknows that the thing he did wasn’t fair to all the people whose lives he changed. He knows that it’ll come back at him with negative consequences. But he’s sticking with the decision anyway because he’s allowing himself a bout of selfishness. Yeah, so Barry Allen, Modern Greek Tragedy in the Making, promptly gets kicked in the face by Fate when his memories of his past life start fading away. What a surprise. He goes to Eobard to complain about things in his brain disappearing, and Eobard laughs at him because Barry’s being affected by the Flashpoint. His new life is overwriting his old life, which means that he’ll lose more fond memories from before the more he uses his speedster powers. 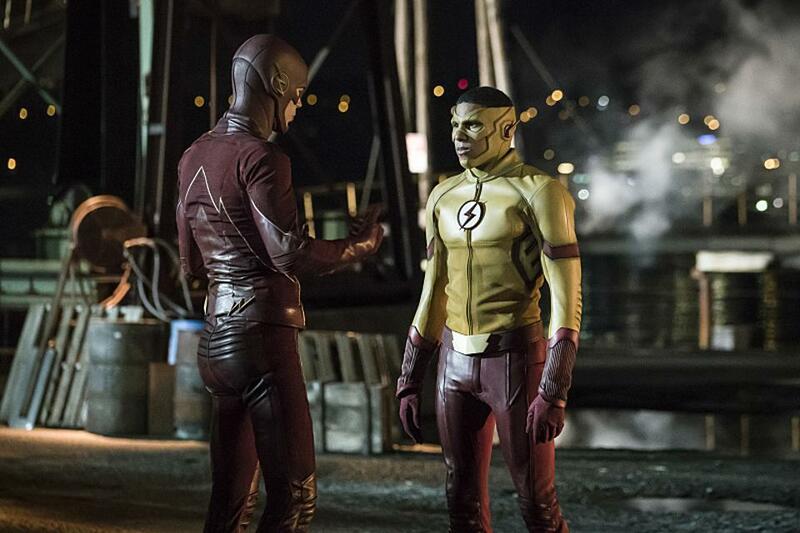 Barry ignores Eobard’s advice because the theme for this show is Barry Is Bad At Thinking Critically. Barry recruits this reality’s versions of Cisco, who is a rich billionaire and wears his smartphone on a watch chain like the wonderfully strange dork he is, and Caitlin, who is an eye doctor for kids and is also adorable. Iris and the makeshift Team Flash help Wally and Barry devise a plan for defeating The Rival, Evil Speedster #3,983 and Kid Flash’s, uh... rival. In the process of conquering The Rival, Wally gets seriously hurt and Barry realizes that he has to fix the whole Flashpoint thing. He gets Eobard to help him. Eobard “I’m So Evil That I Spit When I Talk” Thawne is really happy about this. Oh, how the smug tables have turned, Barry! So that Wally can be saved and all the wrongs righted, Nora Allen gets re-murdered and everything gets put back to normal. Barry gets sent back to a life where his parents are both dead and he’s The Flash and Joe West is handing him a very necessary beer. But wait! It turns out that this reality’s Iris is estranged from the West family for some reason. Barry lets mention of Iris slip, and Joe goes upstairs in an insulted huff. "Oh god, what did I do?" Barry asks himself as he flops into a sad slouch on the sofa. Good question, you zippy nitwit. Uhg, Barry, seriously, what are you doing? The cute of Barry trying to talk to Iris nearly outweighs his stupid. Nearly. Briefly. The stupid comes back in full force almost immediately, though. "You wouldn't do that to me, Barry. After all, you're the hero." Look, The Flash: you don’t put the words of the audience into the mouth of the villain if you want us to keep liking the hero. What are you doing? What is happening with this show? Do Evil Speedsters think there’s some prize for being The Fastest™? Because there isn’t, folks. Just FYI. "The you I know from the future, he's not this stupid." You sure about that, Eobard? Barry’s been on a roll with the stupid lately, across all the timelines and Earths. "Did you — you just kidnapped this woman." Cisco is still the best. "Excuse me? Have I been kidnapped?" "Unclear." Hee. It seems to me that Eobard should want to help Barry immediately after learning about the disappearing memories? I mean, if Barry forgets that he locked him up in a cage, he's never getting out of there. "I thought I could just make things better. But everyone's been paying for my happiness." Other than Wally getting hurt and Joe being a drunk, though, their lives seemed pretty okay. I’m still tentatively hopeful that this season won’t be completely awful.